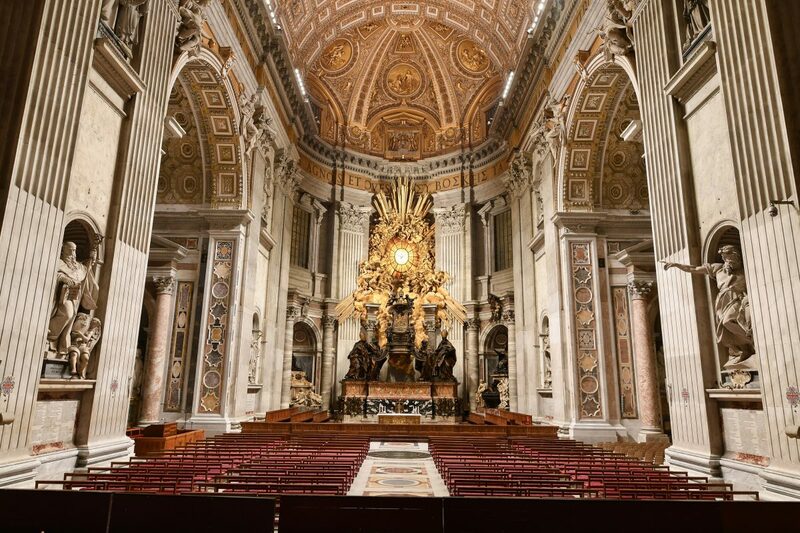 St. Peter’s Basilica in Rome can now be seen in a whole new light, after 100,000 LEDs were recently installed throughout the basilica by the Germany-based high-tech company OSRAM Licht AG. Before and after photos of one of the domes show the dramatic transformation. If these photos are anything to go by, seeing the newly lit St. Peter’s Basilica must be like rediscovering a lost treasure, or even like regaining sight. Now, previously dark or unlit niches can be seen and truly appreciated by fine arts aficionados and pilgrims alike. One photo shows the basilica’s main cupola, or rounded dome. 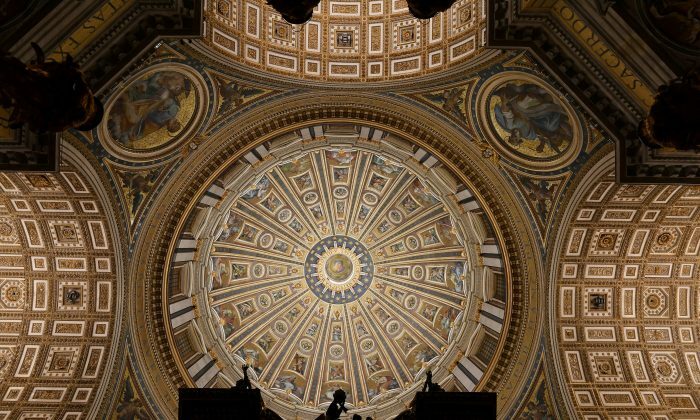 Although the main cupola was primarily designed by Michelangelo, he saw only the base of the colossal 65-foot-high drum, or circular walls of the cupola, built before he died. It was Michelangelo’s pupil Giacomo Della Porta who carried out Michelangelo’s design, completing the cupola in 1590. The diameter of the cupola at its plinth (base) is 139 feet. Below the cupola are four medallions, each 28 feet in diameter, which show the four evangelists: Mark with a lion, Luke with an angel, John with an eagle, and Matthew with an ox. Matthew wrote the first gospel of the New Testament, and the medallion shows him with his pen, all 9 feet of it. Sunlight enters the dome through its 16 windows. Above the windows, a total of 96 figures decorate the dome from top to bottom on six ascending, concentric levels. The lower levels depict important figures in Christendom from the earthly realm: the busts of the 16 popes buried in the basilica, and Christ, the Virgin Mary, St. Joseph, St. John the Baptist, and some of the apostles. As the dome ascends higher, the figures enter into the ethereal, celestial realms, where angels are contained in rectangular frames holding the instruments of Christ’s passion. And higher still, protective angels act as custodians for St. Peter’s tomb. Next are cherubim and seraphim reflected on circular medallions, and then nearest to the peak are the serene faces of winged angels. Moving farther up, the dome decor diffuses into a starry blue sky, and then a large Latin inscription is at the base of the lantern (a small cupola-like structure, usually with decorative arcades, mounted on top of a dome.) Each letter is over 4 1/2 feet high. 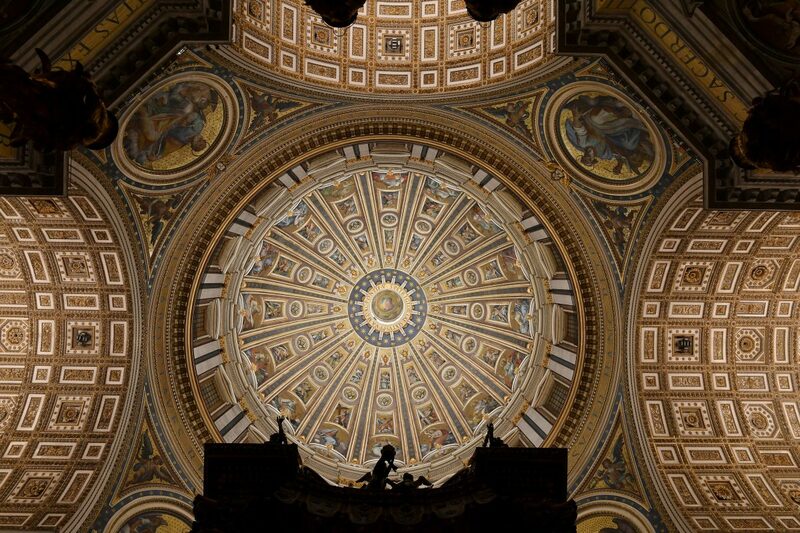 The inscription gives thanks to St. Peter and to Pope Sixtus V, who had promoted the cupola’s construction. Up high, about as tall as a 40-story building, the artwork on the lantern depicts, of course, God. The top tourist attractions in Vatican City are an interesting set of landmarks that lie in the holiest place of the Catholic faith.